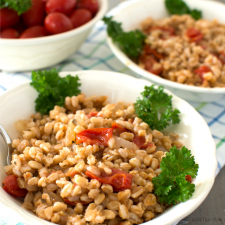 We make our Easy One-Pan Italian Farro with Tomatoes several times a month. Yes! We like it that much, but the bonus here is, when we’re short on time, it’s easy to throw together and even easier to clean up. This dish cooks in one pot and as it cooks the tomatoes, onions, and garlic form a delicious sauce. One taste and you’ll think you slaved over the stove all day. A touch of olive oil, a sprinkle of parmesan cheese, and scattering of basil ribbons finishes this incredible recipe. When I first saw my inspiration recipe on Smitten Kitchen I was a bit skeptical. Deb, who is Smitten Kitchen, kept going on and on about this wonderful dish. The ingredients were common. How could the combination of those everyday ingredients make her gush? But Deb never disappoints me, so I made the farro. She didn’t disappoint me this time either; she was right in her high praise. First, you need a deep pan. Pour two cups of water into the pan and add one cup of rinsed farro. As the farro soaks, cut up half an onion and add that to the farro. Then you mince a few cloves of garlic and toss them into the pot. Since this is Italian Farro with Tomatoes, you need to cut in half 9 ounces of grape tomatoes. They join the rest of the ingredients in the pan. Finally, you need to season the water with salt, red pepper flakes, dried Italian seasoning, and some extra-virgin olive oil. That’s it! 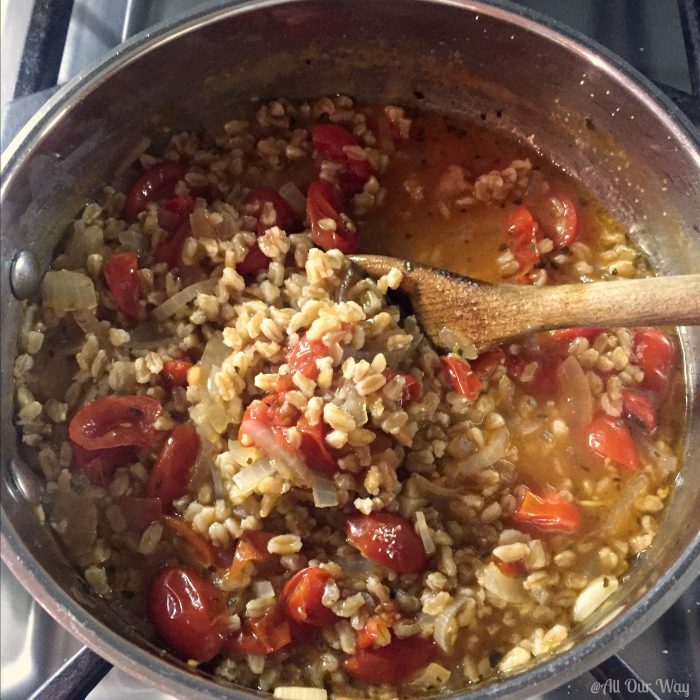 That is all you have to do to make Easy One-Pan Italian Farro with Tomatoes. The stove takes over and finishes the job for you. Within 30 minutes you have a delicious side or a hearty vegetarian main dish. The farro will be chewy. Be sure to check your package to see what kind of farro you have. Farro comes in whole/unpearled, semi-pearled, and pearled. If you want to find out more about the grain, Deb from Smitten Kitchen goes into detail about this. To finish your Italian Farro with Tomatoes, grate some parmesan cheese on top and sprinkle with some basil leaf ribbons. A quick swirl of olive oil completes the dish. Unfortunately, this time when we made Italian Farro with Tomatoes, I didn’t have any basil leaves. Even though we eat a lot of farro, such as Farro and Peas, Warm Tuscan Farro Salad, Farro Risotto, Farro Tabbouleh with Kale, Farro Salad in Red Radicchio Cups, we never tire of it. 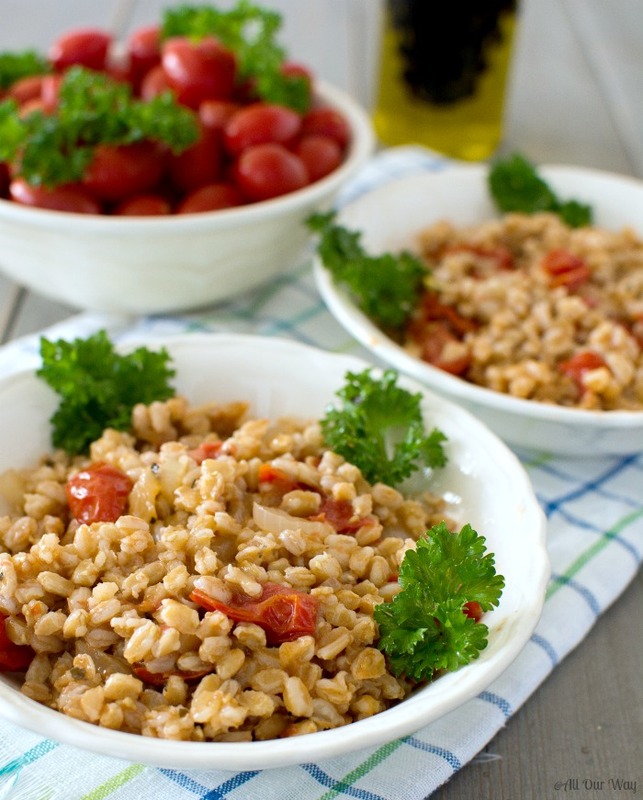 If you haven’t tried farro we hope you give it a try with our Italian Farro with Tomatoes recipe. We know you won’t be disappointed. Be sure to sign up for a weekly newsletter, we’re cooking up a storm in our kitchen and we’d like to share what we’re doing. These recipes are terrific any time of year. Your family will love them. Note: Recipes and content from © All Our Way 2016 are copyright protected. Please so not use content or recipe without prior written permission. If you want to share the information, please link to this post. Grazie! Sounds yummy although I have no idea what farro tastes like. Hi, Dee! It’s chewy, it looks like rice but it has a nutty taste — we prefer it to rice. A perfect easy recipe for a busy holiday season. The simplest recipes I think are the tastiest because you can appreciate each component. 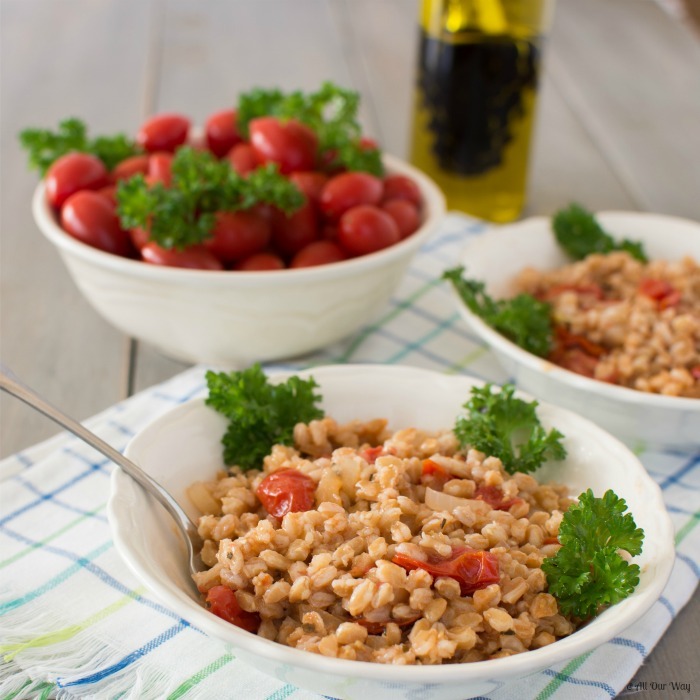 Farro is one of my favorite grains, and adding the tomatoes and Parmesan cheese sound delicious, savory, and incredible. We love farro in our home and use it quite often is soups and stews. It’s a great way to add more nutrients and protein to vegetarian soups. I have used it before in side dishes too, but I’m so inspired by this one-pot Italian version. Looks delicious!!! Such a great recipe, and my first time cooking farro. It was every bit as addictively delicious as you claimed. 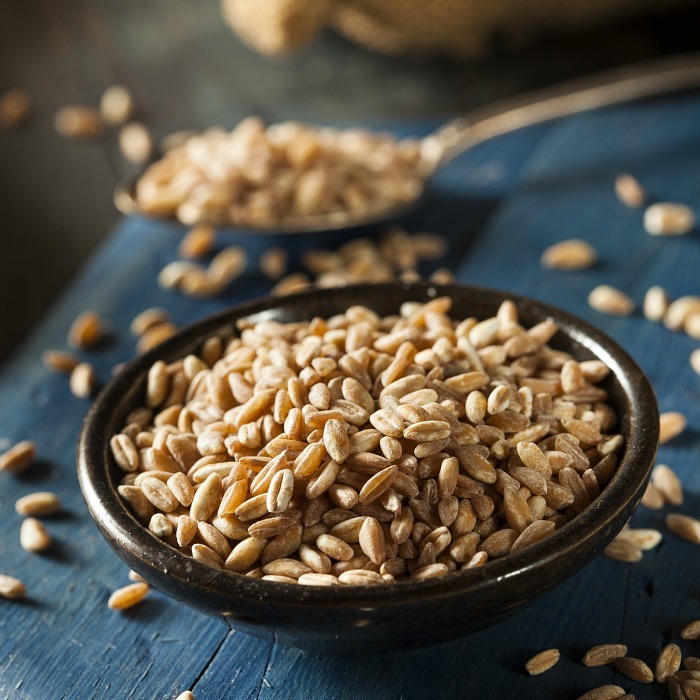 I’ve only had farro a few times, but I am obsessed with it! I love the chewy texture! I would love to give this recipe a try soon! I’ve been on a farro kick lately- so glad it’s picking up more steam! Can’t wait to try your version! You’re going to love this. It’s easy and delicious. This does sound delicious! I am trying to include whole grains in our diets several times a week, so this is perfect! Marisa, I was happy to find this. Several months ago farro was the side dish of the meal I ordered at a fine restaurant, and I liked it so much I wanted to have it at home. But then I forgot about it. Thanks for the reminder! Hello, Jean! I’m glad I was able to remind you. I do like to try to duplicate recipes I enjoy at restaurants. Have a wonderful weekend. Love simple and flavorful dishes like this and farro is a great ingredient! I’ve fallen in love with farro, and cannot wait to try this recipe! Farro is one of my favorite grains – I love it in soups, salads and gratins — this looks so good! Hi, Lisa! If you’re short on time and want something terrific — this is it. I hope you try it. Simple and fresh is always the best! I love this recipe. Thanks! You are right! Simple and fresh always renders the best results. Have a Happy Thanksgiving. That looks easy and delicious. I’ve used that brand of farro and it’s delicious, but you should try the Anson Mills’ piccolo farro. It’s fantastic, especially for a risotto-style cooking. Thank you, Linda, for the heads up on the farro. I’m writing down the name and will be on the lookout. My first place is on the Internet. Hope you and your family have a wonderful Thanksgiving. Un abbraccio! Ciao, Chiara! You will love the al dente texture of the farro. You can even make it as a faux risotto. Of course, it will never replace our true risotto 🙂 Un abbraccio forte! 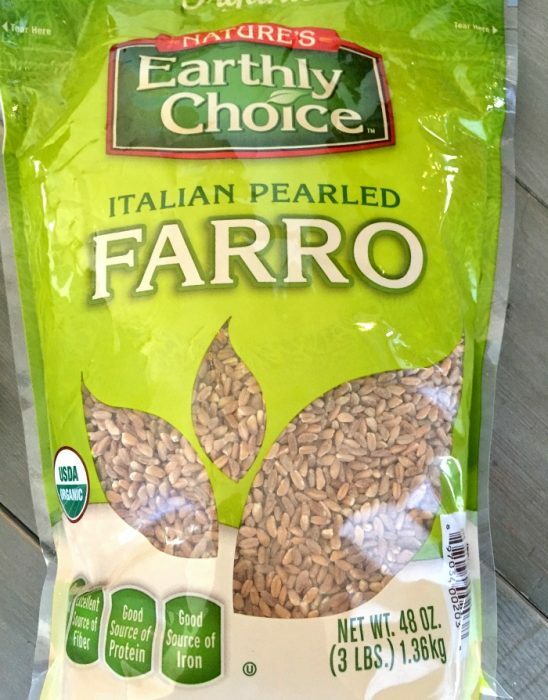 I didn’t know that you call them Farro in the US. We call those Ebly in Europe. 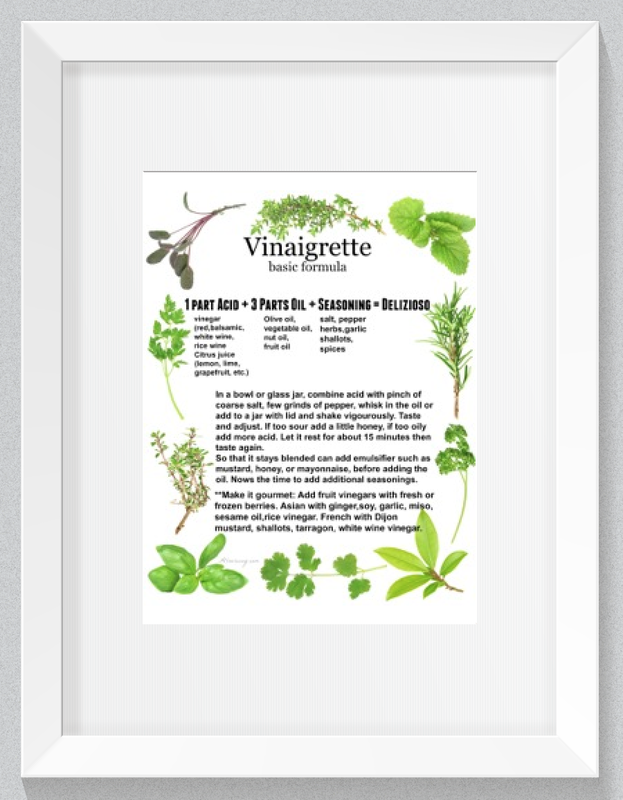 I love these however we make a side dish of it and serve it often with fish. I am intrigued by your one pan dish! Hello, Helene! I didn’t think that one-pan could bring out such a delicious result. I hope you try it and please let me know what you thought of the dish. Love a good one pot meal! Never tried farro before so I’ll have to give this a shot! I’m also a big fan of Smitten kitchen and know that Deb won’t let you down! Hi, Vicky! I’m totally hooked on farro. Try it and see if you like it. And as far as Deb goes, I feel like she’s a friend next door. I love her recipes and her style. Have a Happy Thanksgiving. OOOOH! So excited to have an easy recipe to try, as you know that is all I can handle, LOL! I’ve never heard of Farro, can’t wait to impress hubby with my new dish! This almost seems TOO easy to be good, but I’ve learned over the years that some of my most favorite dishes have the least amount of ingredients and take little effort. I can’t wait to try this! Thinking spicy sausage might find is way on my plate of farro, too ?! Great recipe. I have a bag of farro sitting in my freezer, so I can make your recipe soon. Looks delicious. Thank you, Jovina! I couldn’t believe how easy it was. Let me know how you like it.